Have you noticed that patients who are unsatisfied with their visit to your office are more likely to leave a negative review online than your satisfied patients are to leave a positive review? The nature of the internet is biased, and tends to lean towards negative reviews. This is an inconvenient truth. Put yourself in your potential patient’s shoes. You are researching online and looking for a health care provider. Would you chose a provider that has a relatively high number of negative reviews or a practitioner with overwhelming positive feedback? We allow your satisfied patients to easily access rating sites. With a constant stream of positive feedback and ratings on sites such as Google and Healthgrades you will rank higher in search engines. With more visibility comes a flood of new patients. AdTel has developed a two-tier system designed to engage your patients and get positive reviews. First, we automatically survey your patients after their appointment. If there is an issue you can feel confident that they will take this opportunity to let you know how they feel. Your office staff will have the advantage of dealing with the issue before they go online to “bash” your practice. Second, we help you even the playing field. When we get a review from a highly satisfied patient we thank them for their review and request that they share their experience with others so that those people can experience the care and expertise that they have received. You’ll find that satisfied patients are surprisingly happy to share their experience online for a doctor that has compassionately cared for them. Especially when it is as convenient as clicking on a link, which we provide. I encourage you to schedule a demo of our Reputation Management service. Are your patients satisfied with your service? Is your staff operating at an optimal level? Are you doing everything you can to retain your current patients? DoctorConnect can answer these questions. Our appointment-reminder add-on feature provides short, flexible, easily administered surveys that provide valuable insight to the workings of your practice. Our automated patient surveys get delivered to your patients the day after their appointment, and provide you with instant feedback on the service and care questions you are most interested in. Use our standard survey, or use our intuitive Drag & Drop feature to design your own survey in minutes. We provide you with the most commonly asked questions – use them all or just the ones that apply to your practice. Even add your own questions by just dragging it over to the right side of the screen. You’ll immediately be able to view the survey exactly as your patients will see it. 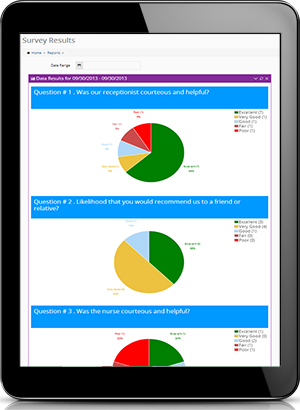 Our fully responsive design means your survey will look good on any device – from desktops to tablets and smart phones. View our demo to see how easy it is to build your survey and determine what your patients think about your practice. As soon as your survey is designed – it will immediately begin to go out to your recent patients. Their response will be made available to you as the surveys are completed – and you’ll be able to view the results in real-time and on demand. Our visual report will clearly show you each question on a scale of 1-5. You’ll see your scores for each question, and graphs that make it easy to spot areas that may be a concern – or highlight a strength. You can compare departments, track satisfaction in specific areas, and view changes to your scores over time. Results are available to you at any time, for any date range you specify. Use your results to find areas of your practice that need improving, or find out where your patients think you can improve. Monitor the improvement of an employee or a department to make sure that your standards are being met on a consistent basis.